Valuri De Mătase, comprised of flutist Terry Ellen Christopherson and Romanian guitarist Mircea Trifan, accomplishes much during their recordings. The flute and electric guitar are both contrasting and complementary instruments, as they both have freedom in tonality and volume, bringing to life many old traditional songs from around the world. These graceful sounds are what make Valuri De Mătase uncompromisingly timeless. Since the duo's inception, the band has produced two full-length records, a self-titled debut and A Year's Day, which followed several years later. While Terry and Mircea call Quebec, Canada home, their songs hail from as far as Ireland, Hungary, England, the U.S., and Mircea's own Romania. More staggering still is that the two musicians wrote their own arrangements and for both albums, and did their own recording, making Valuri De Mătase a trial of love and focus. Most of the songs are short, below four minutes, and few of the songs are slow, making both Valuri De Mătase and A Year's Day tight albums rich with motion and emotion. A handful of the songs grew, in fact, from Celtic and Irish traditional reels and ballads, making for often rambunctious offerings showcased here in the sparse yet authenticity of flute and guitar. “Batuta la Rand”, off of A Year's Day, risks with confidence some spoken word at the beginning, (in Romanian, I think), and then launches into the quick-paced hammered-guitar technique that Django Reinhardt popularized, and yet, instead of Stephan Grappelli, Mircea is balanced by Terry, who weaves a tapestry notes, able to flutter like a butterfly, push like ants marching, and surrender like waves crashing on an isolated shore. This latter metaphor is especially apparent on “Pobjednicki Cocek”, which also pushes Mircea to leave chords behind for something of a sultry bassline. And while A Year's Day succeeds at expanding classical sounds, the duo's self-titled, humble beginnings offer a more niche sound without compromising integrity. An example of this beauty is the aptly titled “Romance”, which the duo filtered into shimmering electric guitar finger-picking and falsetto flute that too often pierces the speakers, and yet Terry is able in this instance to harness the high-pitched energy, making for an almost operatic performance. Key tracks on the first album include the castle-in-the-clouds wonder of “Lamentation”, the song “Cannon”, and the closer “Trees On The Mountain”. A Year's Day has the playful “De Doi Clarinet”, the infamous “Celtic Waltz”, and “Florile Dalbe”, another song featuring vocals and arguably one of the duo's greatest achievements. Placid and also adept, Terry and Mircea's Valuri De Mătase is simultaneously familiar and utterly unique. Guest musicians, such as clarinetist Marie-Eve Simard, connect so well with Terry and Mircea that they've created the “clariflute”, and singers Gabriela Danila and Ariane Roberto add new textures to the compositions. Those interested in traditional music, classical music, and flute, which is key to the duo's agility, should seek out Valuri De Mătase and their two albums, to turn your hours into beautiful platforms for a musical journey around the world. Great work on this disc full of wonderful music that allowes the mind to wander the world. Beautiful work. It's exactly what I was hoping for! To start with, they show a breadth of knowledge and curiosity about music that you might only find in bands such as Pink Martini - one of my favourite tracks is the Huron Carol, which is over 350 years old and was totally unknown to me. They also have a way of breathing new life into overly familiar tunes such as "Dark Eyes", which must have been in every "East-European-restaurant" scene that Hollywood has ever made! ... marvelous cd! The music is lovely, seeming to float out of a mist of ancient revery and permeate the near air with bright soothing flouishes of sprightly ribbons of melody! Relaxing yet energizing and interesting! Much like the goft of oxygen to the cells! I'll be playing it alot on my Saturday morning show"PLANETARY PRISMATIC SONICS" I like every track!! Truely it is for the mind what a drink from cool mountain spring is to the pallette! You have achived a marvel of clarity and joy!!! An excellent mix of varying styles with a great input from the flautist and guitar player. An album for all seasons. VALURI DE MATASE is a duo who formed out of their Love for many Different musical forms. They’ve taken those forms and that love and created something wonderful, an amalgam of Celtic, Rumanian, Jazz and Classical rhythms. You see why we like it? It’s unusual and has just the right edge to keep ours and anyone’s interest. Listen and Listen often.. And support all good music. ... Mircea Trifan and Terry Ellen Christophersen give life - on their first CD - to a couple of very different musical genres. (Balada by Ciprian Porumbescu, “Hora Staccato” by Grigoras Dinicu, Celtic music, Irish music, even an Hungarian Czardas); but joining all this is not by hazard as it seems. …. They say that there it is, somewhere back in history, the Celtic civilisation and the East-Europeans – so the Romanian civilisation too – have an area of intersection. In short, it seems that one of the branches of the Celtic civilisation has roots somewhere close to the Carpathian Mountains - the Balkanic area. This is why there are some “almost Romanian” colours in “Nynth Gwcw” (“Nyth y Gwcw” to be more precise – “Coocko’s Nest” in the old welsh). From this point, to the selection of a Romanian - Celtic repertoire there it was only one tiny step. On another hand, the province of Québec is itself a multicultural place par excellence, who’s large potential has to be fully exploited .. The launch of the 'Valuri de Matase' CD enjoyed a big success amongst the Romanians from the capital and elsewhere. 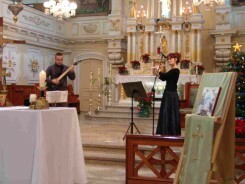 Terry Ellen Christophersen (flute) and Mircea Trifan (guitar) celebrated Christmas Day playing in the Notre Dame de Jaques Cartier Church. The pieces performed- especially Balada, by the Romanian composer Ciprian Porumbescu- unleashed memories and went directly to the hearts of the people. The album, having the same name as the group, is proof of talent and originality and demonstrates that ethnic roots are not a barrier in the universal language of music. Congratulations Valuri de Matase ! We wish you many waves of success ! Quebec City musician and flute player Terry Ellen Christophersen is about to launch an exquisite Cd at Archambault on February 11: Romanian and Celtic music in an original arrangement under an original name, Valuri de Matase - Romanian for 'Silky waves'. .......... The first notes of Ciprian Porumbescu's Balada, played by Valuri de Matase Duo, were recognized immediately and warmly acknowledged. Valuri de Matase is composed of two virtuoso musicians, Terry Ellen Christophersen and Mircea Trifan. The two musicians have an impressive artistic background, and been working together for two years, combining two seemingly incompatible instruments, to create an exceptional performance. Their varied repertoire includes classical, traditional Irish and Celtic, Romanian music and jazz. ... The duo Valuri de Matase, with flutist Terry Ellen Christophersen and guitarist Mircea Trifan ... send vibrations through the hearts, without exception, with an exceptional performance of the Balada by Ciprian Porumbescu, followed by 'Poor Little Heart of Mine'. It's an extraordinary feeling to play here songs from my home, which I carry deep in my heart Mircea confesses.